So why can’t the Bulls be in contention for the championship? 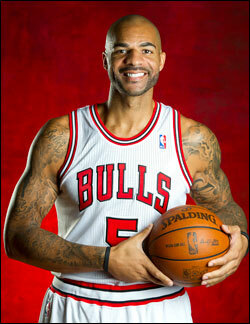 “I think it’s going to be a big year,” Carlos Boozer was saying, or I thought it was Boozer. He said “Hol dat” to a buddy, which I think is a sort of slang or language I’m not accustomed to but now plan to use when ordering tuna but to hold the mayo. He had those same tattoos, but not the softness I’d seen the last two years. He looked thinner, though stronger. Actually, it was a pretty positive day all around at the Berto Center with Rose nothing but upbeat about his return from knee surgery this season and the news of coach Tom Thibodeau’s four-year contract extension through the 2016-17 season. It turns out it wasn’t that complicated. Thibodeau said he always was confident he’d sign an extension as he pretty much privately was assured of it by managing partner Jerry Reinsdorf earlier this year. And Thibodeau said his only disappointment was not signing a lifetime contract with the team. It apparently was limited to four more years on top of the one he has left because it wasn’t clear if the lifetime was his or Betty White’s. Thibodeau said the Bulls would not skip steps and everyone would be required to do his job. He was almost Zen like in his composure. It’s a plan as good as any. Rose mentioned being about two weeks away from cutting, which is where I have been since turning 30. Other than that we have little in common. Media day is for player interviews, but also when the players finish up physicals and record their promotional videos for the team, like on the scoreboard. Richard Hamilton was wearing a fake Lincoln beard. Or he’d become Amish. Anyway, the players take turns at stations set up all around the Berto Center basketball floor and it was refreshing to see Rose welcomed so casually by teammates. I saw a couple greet him with either a “We’re No. 1” salute or something else that might not be taken so kindly if it were not meant so endearingly. I will feel better now when I see it signaled toward me. But that was also a way of teammates saying to Rose he’ll always be a big part of their thoughts. Which is probably also why Rose said he intends to be around the team. Virtually every player on the roster has been at the Berto Center for the last month at different times working out, and Rose said he returned from his rehabilitation in Los Angeles in early September to send his own message, which was one of leadership as well. Thibodeau was said to have left Berto for two and a half hours this summer, all during fire drills. I thought it also was a positive sign of the point Rose was making, that he was intent on showing his teammates the long, grueling hours he is working daily and how much he’d just love to being two-a-days in training camp. No, I don’t see anyone complaining. Which has to be a joy to Thibodeau, who stressed at the team meeting before the players met reporters that playing time and opportunity begins in practice and how hard you work. It’s perhaps an even more important message this season with Rose out for at least half the season and already six new players on the roster and likely at least one more to be signed a few weeks into the season. Which was another theme of the day and for this part of the season, the chemistry that needs to be created with the new players. Interestingly, Rose admitted he recruited a player for the first time, one of the new ones who is actually an old one, Kirk Hinrich. Rose said he envisions Hinrich as someone he can play with a long time and who he admires for his hard working, defensive style. Well, you’ve got to start somewhere. 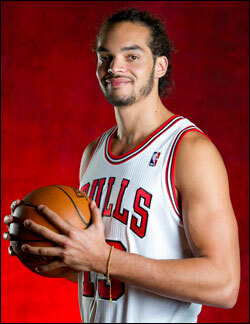 And the Bulls didn’t have a point guard with Rose out and C.J. Watson gone. I’m not sure how much he ever has. But it seemed clear Rose was not feeling sorry for himself. Actually, he talked about being grateful for the injury in a way because of the way it is teaching him the patience he never had, the way he couldn’t wait to get to the NBA, couldn’t wait to get to a title. Not to say he’s not disappointed to be out. But he’s taking it as a life lesson for now, one that will make him stronger mentally as he says he gets stronger physically. I know. I want to give him a hug again. Rose also pointed out things happen, that injuries can occur with others and that there is no reason why this Bulls team shouldn’t be thinking title no matter what anyone else is. “It’s why I love basketball,” Rose said. “You can have all the greatest players, but you have to have a team to win.” Rose said Miami didn’t have all the best players, but they had the right role players competing hard and won. 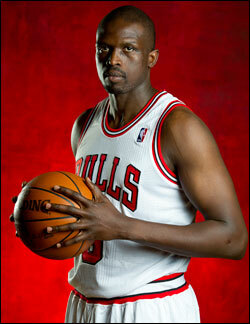 He watched that Finals; Luol Deng, however, said he didn’t. Rose said he was happy Thibodeau would remain his coach for the length of his contract and mentioned how excited he was to see NFL player Adrian Peterson, with a more serious knee injury, back already. I caught up with Thibodeau after the press conferences and he seemed to be working on a game plan for a game against the Wizards… in 2016. Anyway, he admitted he initially was somewhat concerned about the turnover in the bench. But he said he very much likes the new group as well. And perhaps because of how several arrived with the Bulls. There were better deals for the likes of Belinelli, Vladimir Radmanovic and Nate Robinson. But they talked about preferring to be in a professional atmosphere with a demanding coach. Belinelli has a bit of an accent, leading to those imperfectly grammatical quotes. Of course, he probably speaks four or five languages and those of us practicing that American exceptionalism still are trying to figure out one. I also liked Radmanovic, who has bounced around the last few years but played in the Finals with the Lakers in 2008. He was anxious to make eye contact when talking to reporters, which journeymen veterans don’t always do. Especially when you have to look down so far to find the eyes. Anyway, Radmanovic talked about the importance of developing bench chemistry while coaches were saying he was more athletic than they thought he’d be. Did he want to mention Atlanta, Golden State and Charlotte? Radmanovic said we could. We’ll have plenty of time for that. Hinrich also looked like someone else, trimmer, excited, which is what a season or so with the Wizards generally does to someone. I talked to Robinson, which is always an adventure since you can get weary with the speed of his words. I wondered if he’d play more point guard and he said he’s a “hooper.” I think that is good and not illegal. He did say he enjoyed being in Chicago because there were so many restaurants and when you are hungry there was one almost everywhere. He said there were so many it was like “picking your poison.” I don’t think he meant it that way. He also said he chose the Bulls because of how hard Thibodeau recruited him. I did think it was nice he said he was most proud when he watched his games on tape with his kids they admired the way he competed so hard. Jimmy Butler has been playing lots of one-on-one with Robinson after workouts with other players because he figured if you can guard a small man that quick you can guard anyone. Butler probably wins the most time in the gym award for this summer and players said his shot has looked much truer. Rookie Marquis Teague said there hasn’t been much hazing from the veterans yet other than him having to sing happy birthday to Nazr Mohammed. No word given Mohammed’s age whether he needed help blowing out the candles. Actually, Mohammed looks much younger than having just turned 35. The Bulls also have a young big man on the training camp roster, Kyrylo Fesenko. He looks a bit like Billy Paultz and admitted he should have tried to learn to drive when he played in Salt Lake City or Indianapolis. Not in Chicago, he says. But it didn’t seem like the road for the Bulls to somewhere special had as many detours as it appeared this summer. Of course, that’s what the Cubs always say, too.